Honey roasted peanuts have long been a favorite snack food of mine, though I admit that I don’t have them all that often. The peanuts have crisp coating that is both salty and sweet, making them downright addictive. These Honey Roasted Peanut Chocolate Chip Cookies offer a salty-sweet twist on a classic chocolate chip cookie by incorporating both peanut butter and honey roasted peanuts – along with plenty of chocolate chips, of course! You’re going to need a generous amount of honey roasted peanuts for this recipe, but you probably have all the other items that you need in your kitchen already. The peanuts can be whole or halved, but they don’t need to be chopped up any smaller than that. Even a whole peanut (shelled, of course!) is about the size of a chocolate chip, so the two ingredients mix in surprisingly well as you put the dough together. The dough starts by creaming together butter and a small amount of peanut butter, then adding in ingredients like brown sugar and vanilla to give the dough a great flavor base. There is just enough peanut butter to help highlight the peanuts without making these feel like regular peanut butter cookies. I made these cookies a little bigger than average, though they’re not the jumbo bakery-style cookies you’ll see at some places. Each ball of dough was a very generous 1 1/2-inch ball, which yielded wonderfully sized cookies that had a nice distribution of peanuts and chocolate chips in them. Making larger cookies is typically a good idea when you’re using a recipe that has a lot of mix-ins, just to ensure that you get some of everything in each cookie. The finished cookies will be crisp around the edges when they come out of the oven, but they cool down to be slightly softer and chewier cookies. That texture comes from the small amount of peanut butter in the cookie dough, which encourages a softer cookie. They’re tender and a great base for the crunchy peanuts and melting chocolate chips. The cookies don’t taste quite like honey roasted peanuts, but they really capture the salty-sweet peanut and chocolate flavor combination that I was going for. In a large bowl, cream together butter, peanut butter and sugars until light and fluffy. Beat in eggs, one at a time, followed by vanilla extract. Blend in the flour mixture by hand or at low speed, then mix in chocolate chips and honey roasted peanuts. Shape dough into 1 1/2-inch balls and arrange on baking sheet leaving at least 3 inches between cookies to allow for spread. Bake for 12-14 minutes, or until the cookies are just golden on the outer edges and set in the center. Allow cookies to cool on the baking sheet for 3-6 minutes, then transfer to a wire rack to cool completely. 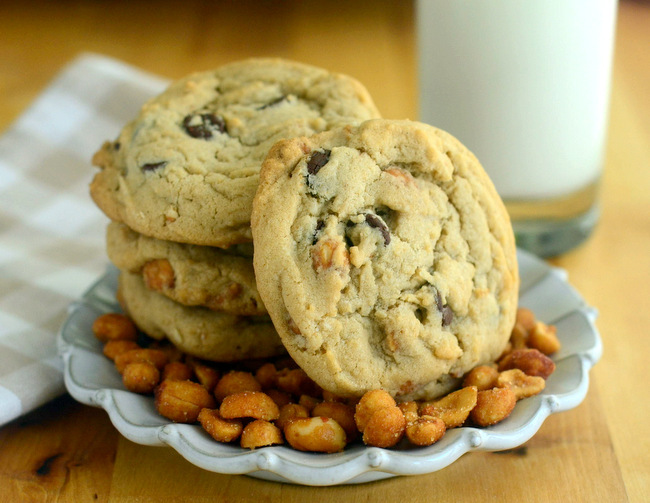 I love the addition of honey roasted peanuts in these cookies- so creative and delicious!